©Bert Gildart: Two morning ago Janie and were camped in a KOA in Brigham City, Utah, and woke to a type of near silence that we generally associate with the falling of soft snow. As we lay in bed deciding whether to look out the window, every now and then we’d hear a soft blop, meaning that a layer of white stuff was probably sliding down the side of our aluminum trailer. Curiosity aroused, we peered outside confirming our suspicions. During the night about eight inches of snow had fallen and it completely covered our trailer, our campground – the surrounding mountains — and presumably the roads separating us from Montana. 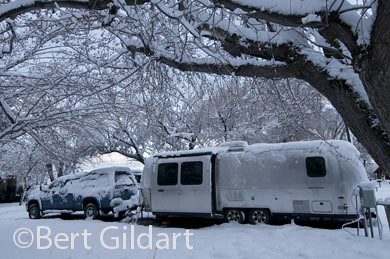 Two mornings ago snow covered our Airstream in Brigham City. Two hours later, we called Chuck and Gail, two friends in Dillon, Montana, who informed us that the snow in their part of southwestern Montana was melting fast . That was good news, and now, off in the distance we could see a normal flow of traffic, and to the north it did appear as though the skies were clearing. Our biggest worry was the highly temperamental weather condition of roads on Monida Pass, but we decided to chance it, knowing that, if needed, campgrounds along the way were many. But now, we had a real incentive to move on, for Chuck and Gail had offered us the use of their driveway to park, and if we could make it we’d have a chance to catch up with the activities of friends we’d gotten to know from our mutual affiliations with two professional writing and photography associations. Chuck (also a professional fishing guide on several well known rivers) and I had both been asked to serve on the board of the Northwest Outdoor Writers Association and this would give us a bit of a chance to think about what we’d gotten ourselves into. “What have we gone and done,” we laughed on the phone. As well, Chuck informed me that sage grouse were performing on a historic lek, and he said that if the weather cooperated we could erect a photo blind and see what transpired. Because I’m writing this after the fact, I know what transpired and can assure you (promise you, in fact!) that Chuck and I were able to photograph a rarely seen phenomena, the results of which I’ll probably be posting tomorrow. But first, we have to get ourselves home. Back then to Brigham, Utah and to the falling of snow… In short, cars on the highway had whipped the roads free and the temperature was climbing fast. 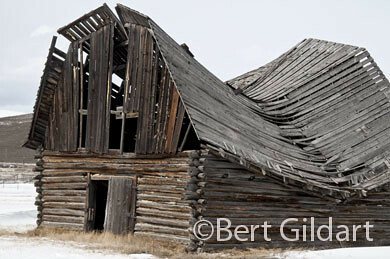 Not only did we have an uneventful drive out of Utah, but also over Monida Pass, (Mon = Montana; Ida=Idaho) where I took time to stop and photograph an old barn, something I do ever time we drive over this historic pass. Well known old barn on Monida Pass. And so we powered on, arriving about 5 at the home of Chuck and Gail, and bless them, they had dinner waiting and had even broken out a bottle of wine. We visited until almost 11 when Chuck, smiled and said that we best be hitting the hay. “You and I, Bert, got to leave here at 5:30 to get the blind up, and we want to be somewhat alert. This entry was posted on Thursday, April 8th, 2010 at 6:43 am and is filed under Photography, RV Travel, Travel, Uncategorized. You can follow any responses to this entry through the RSS 2.0 feed. You can leave a response, or trackback from your own site. Great story and anxious to see the grouse pics soon. Sorry to see that barn’s back finally broke. It’s been fun to watch your progression of photos about it. If barns could only talk! Hope the rest of your drive home is snow free. It’s about time! Grouse story to be posted tomorrow. Got a little behind schedule what with snow, travel etc.